Mathematicians often work with matrices, which are arrays of numbers. When written on a page, a matrix can look like a sea of numbers, so any patterns that might occur in the numbers can be difficult to discern. More and more, mathematicians are turning to graphical representations of matrices, like the two examples here. By using color and form to indicate the values of the numbers in the matrix, these graphical representations can instantly give a sense of the patterns in the matrix. The first picture is a representation of a matrix in which the numbers exhibit a clear pattern; the second picture, by contrast, is a matrix in which the numbers are random. Graphic by David Bailey and Jonathan Borwein. Request their permission before reproducing the graphic. In his 1989 book "The Emperor's New Mind", Roger Penrose commented on the limitations on human knowledge with a striking example: He conjectured that we would most likely never know whether a string of 10 consecutive 7s appears in the digital expansion of the number pi. Just 8 years later, Yasumasa Kanada used a computer to find exactly that string, starting at the 22869046249th digit of pi. Penrose was certainly not alone in his inability to foresee the tremendous power that computers would soon possess. Many mathematical phenomena that not so long ago seemed shrouded and unknowable, can now be brought into the light, with tremendous precision. 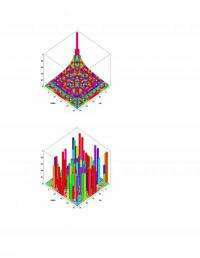 Math needed for graduate theoretical nuclear physics program? As somebody who has had problems with visualizing math applications, I have to say I like this very much. Staring at a page full of expressions and equations can be like trying to read a bowl of soup. It seems to be in the same mindset of Feynman and Penrose's work with inventing " translational " diagrams. When I was in art school I used to try to visualize equations and expressions overlaying what I was drawing, to try and help myself understand maths through physical examples. Apples, oranges, Bob and Alice just don't seem to cut it anymore. Crap, I erased what I wrote. Penrose was thinking about this from the wrong perspective. A sequence of 10 7's appears in pretty much any irrational number, if you solve it to enough digits. If you have an infinite number of digits in a non-repeating string, then there are an infinite number of sub-strings, of an infinite number of lengths, and all possible sub-strings will eventually appear at least one time. If this were not true, then the number would not be irrational. If the main string EVER starts to repeat itself exactly, then you could find a ratio of real numbers to represent it, and it wouldn't be rational. It takes several digits before it starts to repeat, but then it repeats entirely, exactly. So you can say with absolute certainty that there exists a string of 10, 11, 50, and 100, etc, consecutive 7's in the decimals of pi. I saw a proof similar to this involving the "apocalyptic powers" in a book by Cliffor Pickover, which was not exactly the same problem, but it dealt with the notion of "the first power of 2 which contains the 3 consecutive 6's '666'." then he did "double apocalyptic powers" and "triple apocalyptic powers" and so on. Basicly, he proved that any number of consecutive digits substring can be found in some power of 2 if it is large enough. Although you can use the computer to find specific solutions to such searches, the computer is not necessary to prove the assertion correct. That's not necessarily true, Nanobanano. In order for PI to have that property, it must be a normal number. While it is true that almost all real numbers are normal, to my knowledge nobody has proven that PI has this property (though it is likely). Keep in mind that many, if not most, well defined numbers are not normal. PI has a very simple definition, and there exist algorithms to compute the nth digit, so it is well defined. So, on the one hand, while evidence is overwhelming that PI is normal based on empirical calculations, we also have overwhelming evidence that most well defined numbers aren't normal. Therefore, I would advise against saying things with certainty about whether certain sequences appear in PI, unless you have theoretical motivation for doing so. We use numbers to make the real world fit into our minds. Have you ever noticed that a simple proof can be harder than it initially seemed at a glance. I have never seen a computer that can tell the difference other than ones or zeros; maybe this is where the difference is. I always thought that high end language could do that job though. I bet python would be quick to pick up. yes, just run some python scripts... ?Surely, you could write that kind of logic in code.. and then run the scripts on host computers participating in a folding project. Local campuses could implement a folding project on all computers using WiFi. Professors would have full access to a dedicated interface for the computing system. Of course a basic set of tools should be provided to the end-user. A user interface with an automatic script generator would be nice along with examples on how to use the system; maybe a Microsoft-like walk through. Nanobanano your proof of repeating 7s is not correct. The easiest way for me to see that is to construct an irrational number that only has 0s and 1s in its decimal representation. A quick way to do that is to look at any irrational number in its base 2 representation. As you point out, the 0s and 1s will not form a recurring pattern. Then just take this representation and use it as a decimal number instead. viola, an irrational number that has no 7s at all in its decimal representation. I can't follow your argument at all. It's irrational. It never repeats. Ten sevens never appear in it. Not even one seven appears in it.